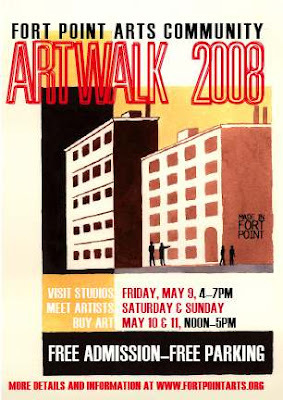 FPAC's 8th Annual Fort Point Art Walk will be held on Friday May 9th from 4-7pm and Saturday and Sunday May 10th and 11th from 12 noon-5pm. Art Walk features 75 artists opening their studios in Boston's Fort Point. Pick up a map at any of the eight participating buildings and explore the studios of painters, jewelers, ceramicists, photographers, sculptors, textile artists, and more. Talk with artists in their studios and discover new works and treasured favorites. Explore Boston's changing Fort Point and see the unique waterfront warehouse district that is New England's largest arts community. Enjoy the opportunity to purchase works of art and fine craft directly from local artists. Studios are all located within a three-block area, a short walk from T and commuter rail at South Station in downtown Boston. Art Walk is self guided: maps and directories will be available at our information booth at the corner of A and Binford Streets, and at all participating buildings including 300 Summer Street, Midway Studios at 15 Channel Center Street, at 249 A Street, and 319 A Street. Free parking will be available in the Central Parking Lot directly across from 249 A Street, and the Channel Center Parking Lot at A Street and Iron Street. Boston Arts and Culture is devoted to giving you the best in arts and culture that boston has to offer. When you need reliable alternative information about where to eat, things to do, where to shop, places to explore or parties to check out, I will be here with reviews, links and other pertinent information. Boston based artist(painting,video) by way of NYC and Chicago. My paintings range from small figurative works in acrylic to large scale graffiti style murals. My videos document life and various sub-cultures. In my spare time I organize events and curate art shows. I do freelance graphic design, illustration and marketing.